eNLokam: Beelzebufo, the Largest Frog! A team of researchers in Madagascar has made a discovery recently. What they found was the fossil of the largest frog that ever lived in the world. The frog named Beelzebufo, or ‘devil’s frog’ is thought to grew upto 16 inches long and weighed 4.5 kilograms! 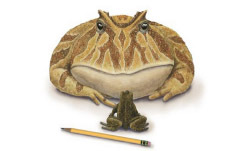 The name “Beelzebufo” comes from the Greek word for devil (Beelzebub) and the Latin word for toad (bufo). The frog huge had a protective shield, an extremely wide mouth and powerful jaws. These features made Beelzebufo capable of killing lizards and other small animals. By comparison, the largest living frog today is the goliath frog of West Africa, which can be 12.5 inches long and weigh about 3.2 kilograms. The Indian Connection of Curiosity!